A view of Humanyun Tomb engulfed in smog in New Delhi, Saturday, Nov 3, 2018. As the onset of winter has brought in thick smog, Delhi has woken up to a blanket of hazy dust with the air remaining toxic. The overall Air Quality Index (AQI) of Delhi was recorded at 342, which falls in the "very poor" category, according to data of System of Air Quality and Weather Forecasting And Research (SAFAR). At Dhirpur, the AQI was 337 at 9:30 am, while in Mathura Road area, it dipped to 'very poor' category at 350. Furthermore, AQI near Pitampura, Airport Terminal 3 and Delhi University stood at 343, 319 and 350, respectively. 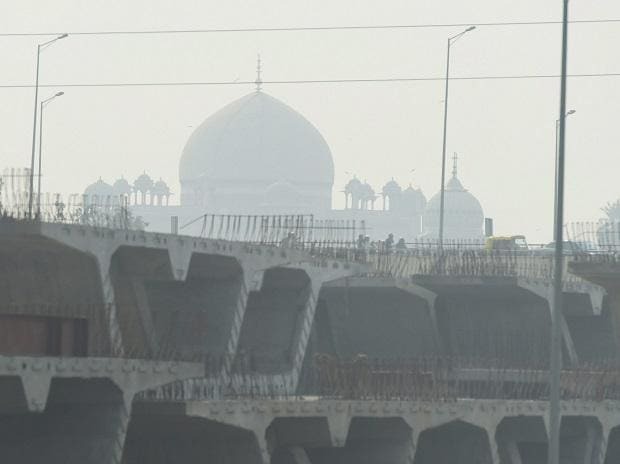 The Environment Pollution (Prevention & Control) Authority had issued a notification predicting that air quality between November 1 and 10 will rise to 'severe' category. Experts believe this change has occurred because of the western disturbance that hit the Himalayan region in October, resulting in a dip in temperature and rise in the percentage of moisture in the air.